PhoCusWright Inc;, the premier global travel, tourism and hospitality research and events business has been acquired by Northstar Travel Media. 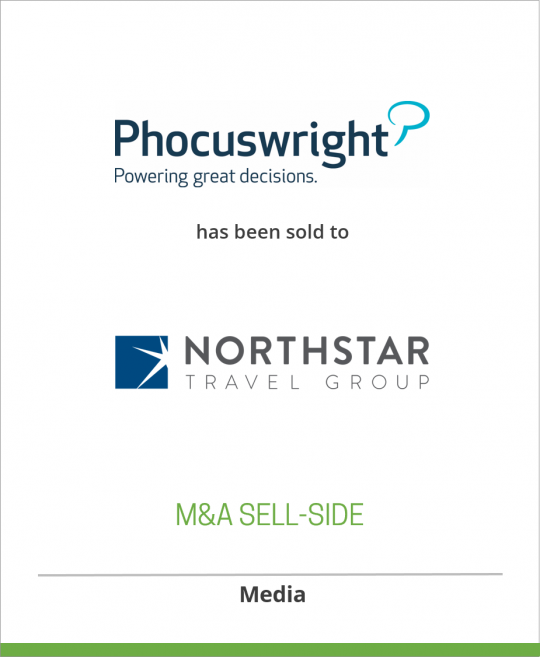 PhoCusWright Inc., the premier global travel, tourism and hospitality research and events business has been acquired by Northstar Travel Media, the leading business-to-business information company serving the travel and meetings industries. The combination creates a global travel research, media and events powerhouse. PhoCusWright annually produces the acclaimed PhoCusWright Conference, a gathering of global travel industry leaders, visionary thinkers and innovators with the “next big idea.” PhoCusWright is the research authority at the intersection of the Internet and the global travel industry, delivering industry-standard B2B and B2C marketplace intelligence through syndicated subscriptions and custom research on market segments, trends and geographies. PhoCusWright was founded by Philip Wolf in 1994, as the secular shift of online travel sales, marketing and distribution was unfolding. Wolf is an authority on the impact of technology on the travel industry and speaks frequently at events around the world. He will continue as chairman of PhoCusWright Inc. The company becomes a wholly owned subsidiary of Northstar Travel Media LLC. Northstar Travel Media serves the retail travel, meetings and conventions, corporate travel management and incentive markets with leadership brands including Travel Weekly, TravelAge West, Meetings & Conventions, Successful Meetings, Meeting News, Business Travel News, Procurement.travel, and Incentive; database-driven electronic publications Hotel & Travel Index, Official Cruise Guide and M&C Facilities Search; and online subscription services The Beat, Travel42, Weissmann Reports, Intelliguide Corporate, BTP24 and Star Service Online. The company also produces more than 20 face-to-face events in the served markets of retail travel, corporate travel and the meetings industry. This is the fifth acquisition that Northstar has announced in the last 18 months. Last year the company acquired the Nielsen Travel Group, the Home-Based Travel Agent trade shows, and ProMedia.Travel. Earlier this year, Northstar acquired the assets of the online information site, LuxuryTravel 360. “We are actively investing in our business through organic initiatives and acquisitions that strengthen our position in core markets,” said Kemp. “PhoCusWright is strategically important to Northstar, particularly in growing proprietary paid information and face-to-face events,” he said. To complement its primary research in North and Latin America, Europe and Asia, PhoCusWright produces several high-profile conferences in the United States and Germany, and partners with conferences in Canada, China and Singapore. Industry leaders and company analysts bring this intelligence to life by debating issues, sharing ideas and defining the ever evolving reality of travel commerce. The company is headquartered in the United States with Asia-Pacific operations based in India and local analysts on five continents. Northstar Travel Media is the leading provider of news, information and data for the travel, meetings and hospitality industries and owns leadership brands Travel Weekly, Business Travel News, Meetings & Conventions, Successful Meetings, Incentive, Meeting News, Procurement.travel and TravelAge West. OfficialCruiseGuide.com, and M&C Facilities Search — provide in-depth data on hotels, meeting and convention properties, and business travel in the United States and internationally. In addition to its directories and periodicals, NTM publishes a number of online subscription information resources, including The Beat, Travel42, Weissmann Reports, STAR Service Online, Intelliguide Corporate and BTP24. Northstar produces more than 20 face-to-face events including CruiseWorld2011; Home-Based Travel Agents Shows; LeisureWorld2011; M&C InterAct; Successful Meetings Universities; TAW ExecConnect; The Beat Live; and the Travel Weekly Leadership Forums. Northstar also is an industry leader in marketing services, custom communications, content licensing and database management serving the travel and meetings industries. Based in Secaucus, New Jersey, USA the company also has offices in New York; Glen Ellyn, Illinois; Los Angeles; and Winston-Salem, North Carolina. Northstar Travel Media, LLC is a portfolio company of BV Investment Partners, a leading private equity investor in the information and business services, communications, and media sectors.